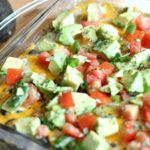 A delicious and protein packed cheesy chicken enchilada quinoa casserole recipe that will soon become one of your family favorites. 2 cups of shredded cheese my favorite is the Kraft Mexican 4 cheese blend and one bag equals two cups! To get started, heat your oven to 350 and prepare an 8x8 baking dish. Cook the quinoa according to the instructions. If you haven't already, boil and shred your chicken breast. In a medium sized mixing bowl add 2 Tbsp cilantro, 1 cup shredded cheese, quinoa, tomatoes with chilis, black beans, half of the can of sweet corn, verde enchilada sauce, cumin, chili powder, white pepper, black pepper, and salt to taste. Mix everything well, and then pour into the 8 x8 baking dish. Cover with the last cup of cheese and then bake in the oven for 15 minutes. Remove from oven and allow to cool for 5 minutes. Then top with chopped Roma tomato, chopped avocado, green onion tops, and remaining 2 tsp of cilantro. Serve immediately.